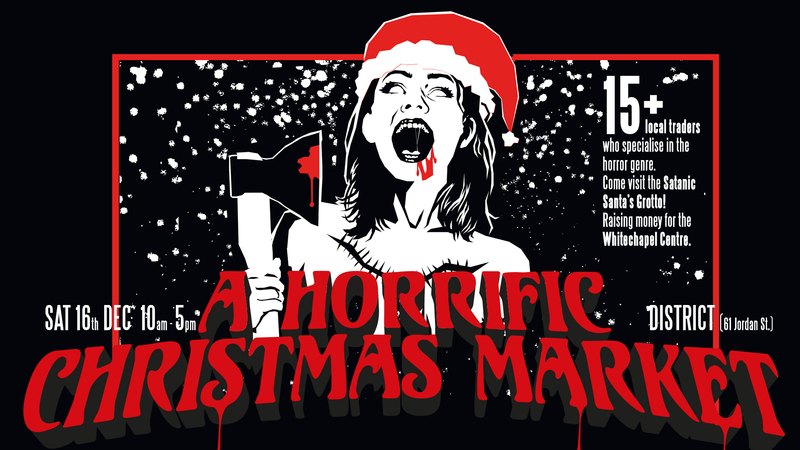 Check out this gorgeous poster to announce that Liverpool Horror Club are hosting our first ever HORRIFIC CHRISTMAS MARKET! Rest assured that you’ll not find any of the usual chrimbo tatt here that you get at conventional xmas markets. We’ve assembled a coterie of local independent traders who work exclusively in the horror genre. 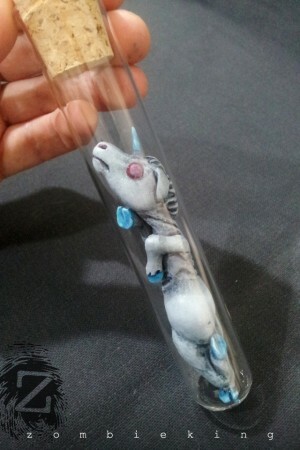 You’ll be able to check out original artwork, plagerised artwork, prints, props, patches, and babies in glass tubes. We’ll have independent filmmakers selling their wares, alongside FX artists selling their body parts. Get your filthy mits on horror-themed xmas cards, horrific t-shirts, unpleasant badges and putrid pins. You’ll even be able to find horror movie memorabilia, indie horror books, underground zines, and terrifying comics books alongside their even more terrifying authors! This is a list of the traders who will be at the event – all of which work exclusively in the horror genre! ^^I’l be there trading as Zombieking and running the Liverpool Horror Club stall. Our boss LHC tees will be on sale at this event for just a tenner! Ok, ok. so it’s almost christmas – I guess we have to acknowledge the festivities somehow. We’ll be playing host to S̶a̶t̶a̶n̶ ̶C̶l̶a̶w̶s̶ erm, sorry – I mean Santa Claus. He’ll be here. Santa, definitely not Satan. Old Nick himself will have a grotto decked out with bones, offal, severed limbs and fairy lights! If you can convince his delinquent Elf helpers that you’ve been a naughty girl or boy, then you might even get to pay the ol’ git a visit and get a terrible present! If you fancy a horrific xmas make-over for the day, we’ll have Effie_Dahmer SFX artist on hand to change your look. But this’ll not be the usual butterflies & glitter that you get from regular facepainters – we’re talking scars, wounds, skullfaces, or good old zombification! There’ll be music. The bar will be open. People will be laughing and children will be crying! 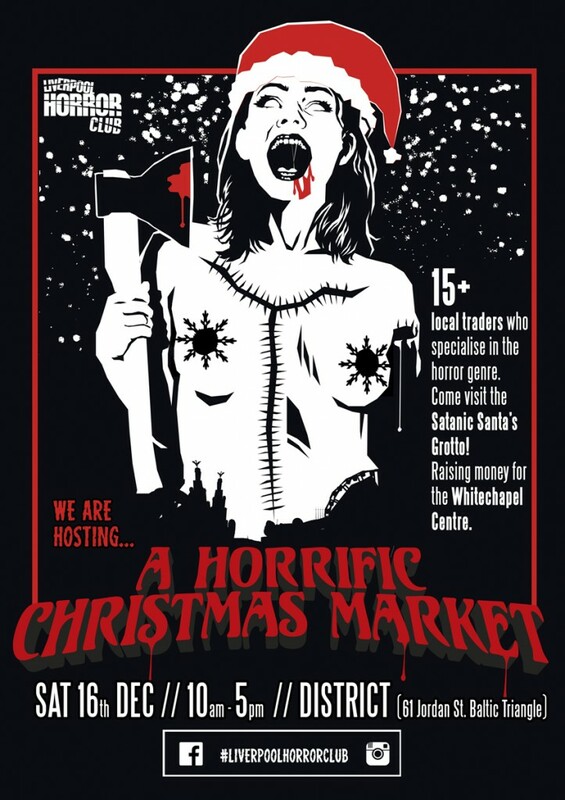 So come along, enjoy the hospitality, get to know your local horror community, and buy some amazing things that you will not see at any other market in our fair city! And most importantly, help us raise some much needed money for the Whitechapel Homeless Centre. SAVE THE DATE: SAT 16th DECEMBER! !